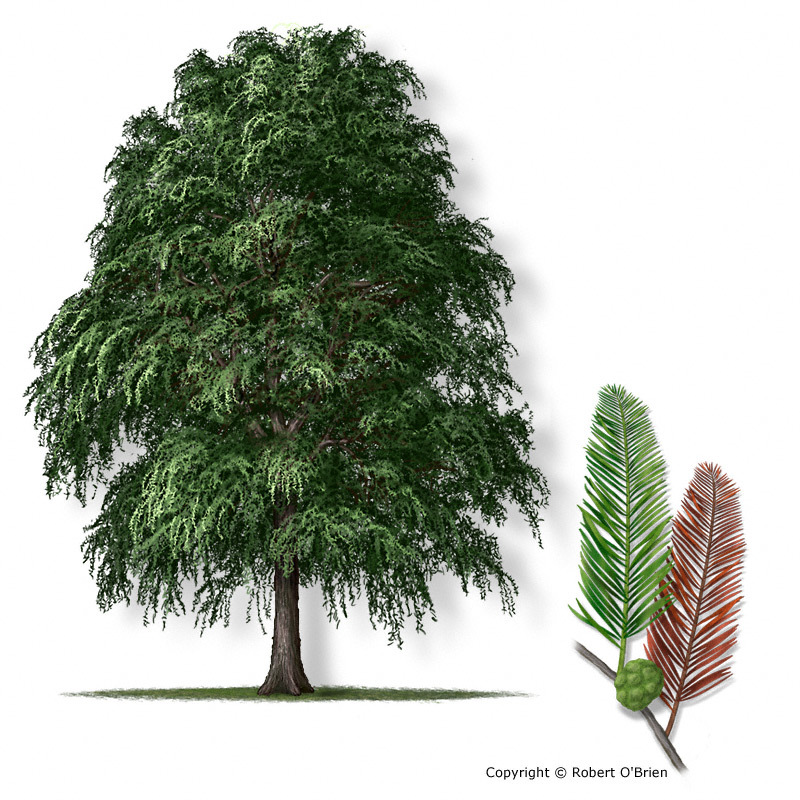 A fast-growing, large tree to 70 feet tall and a thick trunk up to 6 feet in diameter or more, with an irregular, rounded or flat-topped crown and drooping branchlets. Unlike the closely related baldcypress, this species does not produce "knees." Streambanks along the Rio Grande, its tributaries, and nearby resacas. Planted as a landscape tree as far north as Houston, where the leaves become deciduous. The delicate, light green leaves are flattened, about 0.5" to 0.75" long, very narrow, and arranged in feather-like fashion along two sides of slender branchlets 3" to 6" long; persistent and evergreen in extreme South Texas, but semi-evergreen or deciduous farther north. Male "flowers" in long clusters that resemble oak catkins, 6" to 12" long, with the individual flowers spread out spirally along the central thread-like stem; female "flowers" are small and inconspicuous swellings on the previous year's branchlets. A round cone, to 1" in diameter, surface rough, green and glaucous at first, but turning brown and woody later. Reddish-brown, smooth on young trunks and branches, but developing shredding scales and, eventually thick, rough ridges and fissures on older trees. Wood is similar to baldcypress, and several parts of the tree reportedly have medicinal qualities. Used increasingly as a landscape tree. Baldcypress (Taxodium distichum) occurs commonly in Central and East Texas and in landscapes across the state, but has shorter male flowers in the spring; also produces "knees." The largest reported tree of this species, the "Tule tree," near Oaxaca, Mexico, measures over 125 feet tall with a circumference over 150 feet!